The best-selling novel, “The Maze Runner,” by James Dashner has arrived in theaters with a $3.25 million dollar box office debut. “The Maze Runner” takes place in a post-apocalyptic world and centers around survivor Thomas (Dylan O’Brien). Thomas finds himself in the Glade, the maze’s central living area where survivors operate as their own human climate. Inhabitants of the Glade have been put in the maze for no apparent reason, forcing them to send out maze runners daily to find a way out. When Thomas is given a tour of the Glade by leader Alby (Aml Ameen), he is instructed not to go near the gates of the Glades when they are open. He proceeds to do so anyway as his curiosity gets the best of him. Shortly after the maze runners return, Thomas expresses his interest in becoming one as well. Members of the Glade dub him foolish and delirious as being a maze runner isn’t easy. 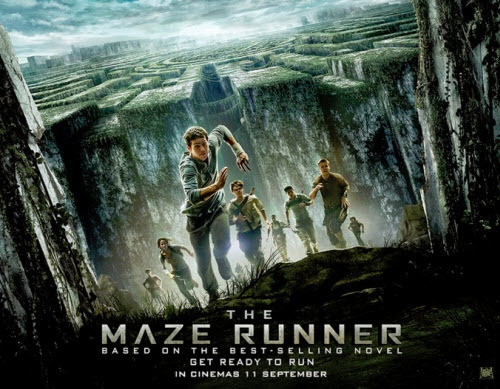 Although the Glade members discourage Thomas, lead runner Minho (Ki Hong Lee) sees his fervor and decides to take him into the maze anyways. With Thomas’ help, the maze runners find enough evidence to get past grievers, creatures that roam the maze at night when the Glade’s gates are closed. Thomas puts the residents in danger by tampering with the maze’s system of order, getting the whole Glade attacked and killing Alby, among others. As the first installment of the “Maze Runner” series, this film demonstrates a thorough introduction to the dystopian world in which the drama takes place in. From minor details to major discrepancies, director Wes Ball does a great job at depicting life in the Glade. Based on a very popular teen novel, the film, nevertheless, is attracting audiences of all ages. Despite detailed depictions, the film starts off a bit confusing for those who haven’t read the book, leaving them ignorant about what is happening. As the movie progresses, the audience will have to keep an open mind to fully understand the rest of the film. Running at 113 minutes, this PG-13 movie serves the audience well and never fails to excite. “The Maze Runner” features a plot packed with action and suspense, putting crowds on the edge of their seats. “The Maze Runner” is a successful first installment to the “Maze Runner” series and serves as a promising foundation for the franchise.